NOW ENROLLING CHILDREN AND SPECIAL CLASSES FOR ADULT WOMEN! 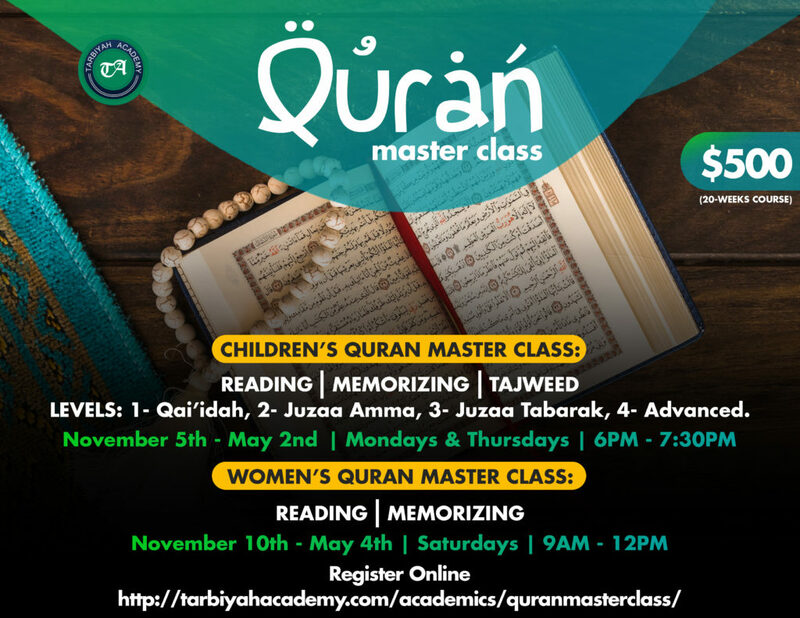 The Masterclass program will condense four, 45-minute lessons, into 2 sessions per week lasting 90 minutes each (with a snack and break provided), with a goal to develop a love for the lifelong learning of the book of Allah within each student. Placement into each level, and advancement between levels, will be required by regular assessments and feedback. Ms. Hagar Ibrahim will supervise and manage this program. Please read Ms. Ibrahim’s bio on Tarbiyah Academy’s Faculty & Staff page. CHILDREN: Every Monday and Thursday from 6:00 pm to 7:30 pm. ADULT WOMEN (NEW): Saturdays 9:00 am – 12:00 pm. 20 weeks of classes start on Monday, November 5th, 2018 (children) and Saturday, November 10th (adult women). Maximum of 10 students per level (up to 40 students total). Students will be allowed to move onto the next level of classes if they fulfill the objectives of the current class in which they are enrolled.